Senate Majority Leader Harry Reid (D., Nev.) launched another tirade against libertarian philanthropists Charles and David Koch on Tuesday over their maniacal efforts to "buy America." It was the latest salvo in the Democratic Party’s war against the septuagenarian brothers, both of whom are strong opponents of cancer. Reid had previously attacked the Kochs as "immoral and dishonest" and "about as un-American as anyone I can imagine." He’s not alone. Left-wing billionaire and reluctant democracy advocate Tom Steyer has mused that David Koch, a prostate cancer survivor who has donated more than $300 million to cancer research, will go down in history as a "famously evil person." Liberals have even gone so far as to question the integrity of a cancer patient who told her story in an ad produced by Americans for Prosperity, a Koch-affiliated pro-freedom advocacy group. In one of his earlier outbursts, Reid suggested that Julie Boonstra’s story was among the numerous "untrue" horror stories about Obamacare. Now Democrats are threatening her with legal action if she doesn’t shut up. Democrats may claim to be anti-cancer, at least when the cancer is caused by Mitt Romney, but their actions suggests otherwise. There's something deeper at work here. How else can we explain this disturbing trend of pro-cancer rhetoric? Since when does surviving cancer, and spending millions to find a cure, make someone a "famously evil" person? This has all the symptoms of a sinister dogwhistle campaign to rile up the cancer skeptic wing of the Democratic base and delegitimize the Koch brothers. This same overt bigotry was on display during the government shutdown in October, when Reid questioned the intelligence of a female reporter who asked why Democrats were refusing to fund cancer-research for children. "If you can help one child who has cancer, why wouldn’t you do it?" CNN’s Dana Bash wondered. "Why would we want to do that?" Reid grumbled. 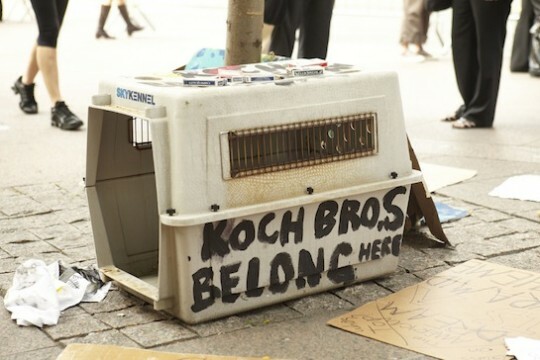 This entry was posted in Politics and tagged 2014 Election, Democratic Party, Koch Brothers, Parody, Satire. Bookmark the permalink.